Accommodation: 1 double bedroom and 1 twin bedroom, living/dinning room with a large open fireplace, a very well equipped kitchen with dishwasher, washing machine, fridge/ freezer, separate WC, a large bathroom with 2 basins, bidet and shower. The cottage entrance faces west with a garden and patio area with garden furniture and a barbecue. Floodlit 5 metre x 11 metre swimming pool, south facing with sun all day and stunning views over the orchards and the village. Linen and towels provided. Central heating included in winter. Activities include cycling, riding, tennis, boating and golf. Resident owners. Relax and enjoy nature in the very peaceful surroundings of Domaine Lapeze, one of the original resting places along the route Santiago de Compestela. 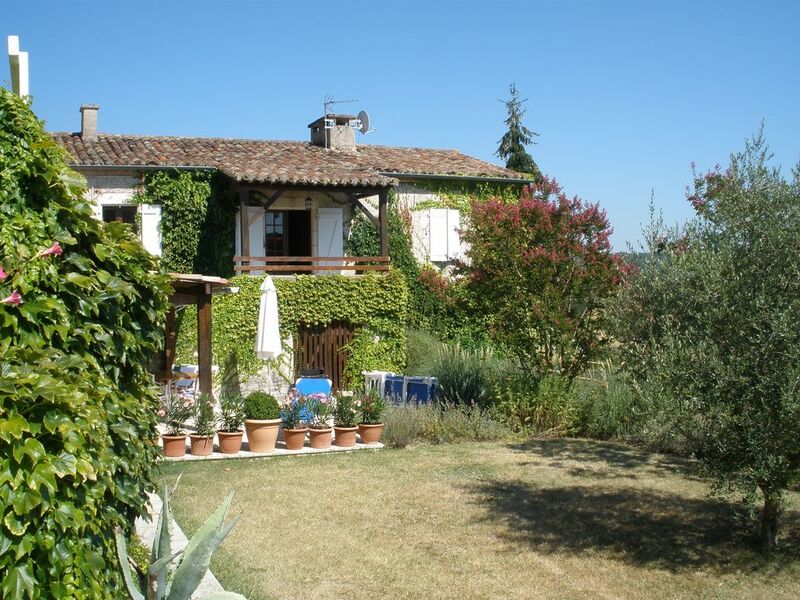 Situated in 12 acres of hilly countryside, surrounded by our own plum orchards and vineyard, 1.5km from Montcuq, a thriving village with shops, restaurants, and a weekly Sunday market. Things to do: Domaine Lapeze is the ideal base from which to discover the medieval cities of Lauzerte, Cordes sur Ciel and St. Cirq Lapopie as well as the treasures of Cahors, Montauban and Moissac, while enjoying the culinary delights of south west France. Theme holidays ie. cookery and art courses as well as gastronomic tours are avialable. Please request more details. Les Terrasses: Accommodation: 1 double bedroom and 1 twin bedroom (both en-suite). Living/dining and kitchen area with 2 gas burners, fridge, an electric kettle, toaster, microwave, oven and washing machine. Covered access to the rooms from the upper terrace. The atelier faces west and leads directly into the garden and vineyard. There is a patio area equipped with chairs, table, sun-loungers, parasol and a barbecue for your exclusive use. Floodlit 5 metre x 11 metre swimming pool with diving board, south facing with sun all day and stunning views over the orchards and the village. Linen and towels provided. Central heating included in winter. Activities include cycling, riding, tennis, boating and golf. Domaine Lapeze is the ideal base from which to discover the medieval cities of Lauzerte, Cordes sur Ciel and St. Cirq Lapopie as well as the treasures of Cahors, Montauban and Moissac, while enjoying the culinary delights of south west France. Theme holidays ie. cookery and art courses as well as gastronomic tours are avialable. Please request more details. Domaine Lapeze is near the village of Montcuq, 25km south-west of Cahors in the Lot.